Coming off the bike, I knew I was in good shape to run. Finishing the first two legs with time to spare took the pressure off about finishing the race before the midnight cut off. As long as I could keep moving forward, I would be able to finish before the time cut off. 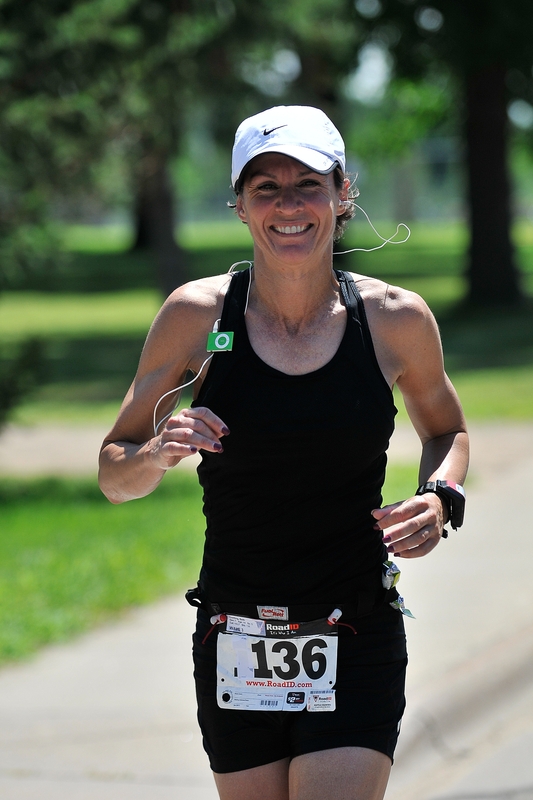 I was pretty excited to run and my plan was to keep my heart rate in zone 1 and stick with my nutrition plan. I knew I would be good for an hour and I was curious to see how long I could last after that. Here I am seeing my family for the first time on the run course, around mile 4. After the first hour I felt fine but my heart rate was about 5 beats higher than it was during training due to the heat. It was still well within zone 1, but I slowed down just a little bit and it dropped to where it was supposed to be. The half marathon point came and I was still running fine and I was excited to see my half marathon split at 2:10. 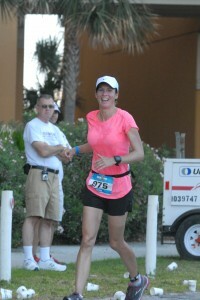 At that point, I felt like I had accomplished everything I had set out to do when I signed up for the race. I was really proud of myself. I told myself that if I didn’t feel good that I could walk and I would be happy with my result as long as I crossed the line. I still felt totally fine so I just kept chugging along and sticking with my nutrition plan, walking through the water stops and then getting going again. The course is 6.5 mile out and back that is done twice, so there is great people watching the whole way. You get to see the same spectators over and over again and they are fantastic. It’s also great for spectators because they can stay in one spot and see their racer several times. I got to see Mike and my friend who was racing 3 or 4 times. It was fun to see them on the course and that they were both doing well. Mike had broken his lower leg bone just 7 weeks before the race, but he was running fine and would go on to PR all three legs of the race, finishing right at 12 hours. At mile 18 I got a side stitch, so I took some walk breaks to see if it would go away. Miles 18 and 19 were my slowest and when I saw my family for the last time on the course, I told them not to worry about me if they didn’t see me for a while. I figured if it kept up that I might have to walk the rest of the race. After those two miles, though, it went away. I ran all of mile 20 and ran for the rest of the race. 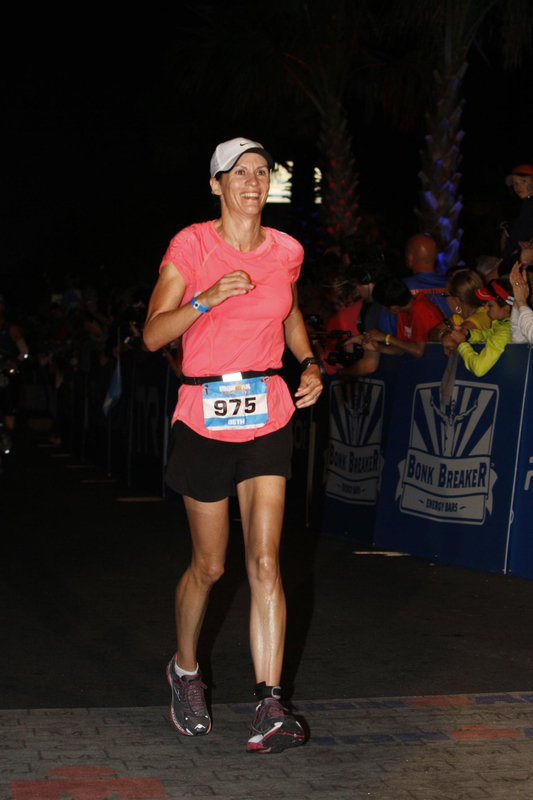 Once my side stitch went away, I felt fine and I was shocked at how many people I passed. Here are my splits. It got dark shortly after the half and I had no idea how fast I was running after that. I know I was taking longer to walk through the water stops as the miles added up, but my heart rate stayed down and I just kept going. I really didn’t have an excuse to walk because I felt totally fine. The run was incredibly satisfying. I stuck with my nutrition plan even though it meant that I had to eat and drink when I didn’t want to. I stayed in the right heart rate zone which enabled me to run the entire marathon. My marathon time was 4:39:29, just 7 minutes slower than my Marine Corps Marathon time from 2011. For the past year, I had spent countless hours in training working on my aerobic base. I had spent a lot of money and time trying to heal from injuries and build strength. I had eaten a lot of foods that I didn’t want to eat to change my metabolism to burn fat for long periods of time. 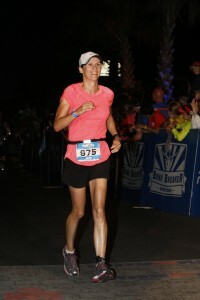 Now on race day, there I was running the entire marathon completely pain free and I wasn’t even out of breath. Crazy. Coming down the last stretch, the feeling of accomplishment was overwhelming. How did this happen? Just eight years ago, I could only run 30 minutes without stopping. I struggled to finish my first marathon in just under five hours only five years ago. Three years ago, I finished last in my age group in my first Olympic distance triathlon. Two years ago I was diagnosed with cancer and had to physically and mentally recover from surgery. And somehow, in the marathon after biking 112 miles, I was passing people that had intimidated me for the previous two days. I passed about 200 of the fittest people I have ever seen. Me- the lady that gets asked on a regular basis if she is limping. Not only was I doing it, but I felt fantastic. I loved it. I had trained hard and, more importantly, I had made smart decisions during training and racing. I’m not saying I did everything perfectly, but I tried hard and worked consistently throughout the whole year. And that is how I remember finishing. I’ve already posted the picture of me crying, but I only cried for a few seconds from joy. My official time was 12:54:05 and I finished 34th in my division which put me just in the top third, and I finished right in the middle of all finishers. 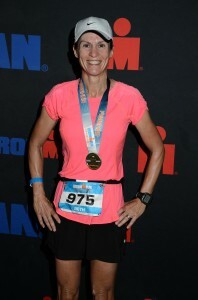 And now I am and will always be an Ironman! What a wonderful experience all around! I am so glad I got to read this story from start to finish. What an inspiration you are…you motivate me to keep working hard! You make me believe that everything is possible. 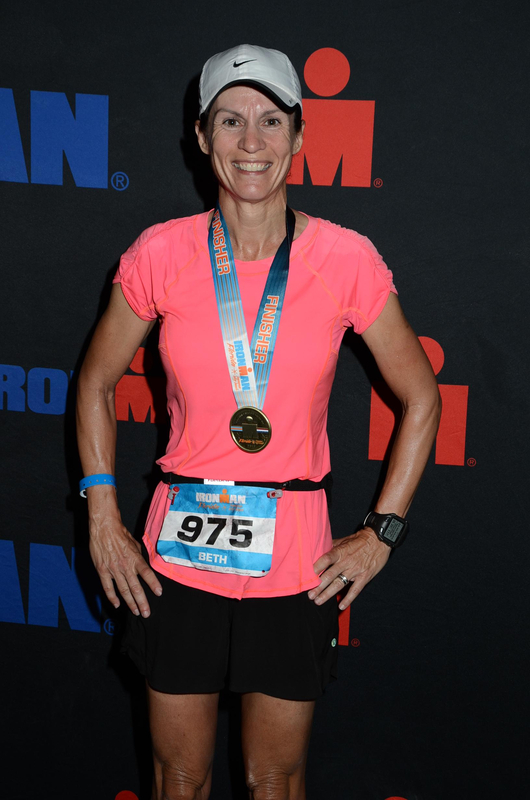 Big congrats once again Beth…you are definitely all that an Ironman represents! OMG you are beaming! I am beaming for you! Beth how amazing. I’m getting teary I’m so darn happy for you. I know what you’ve gone thru. How positively thrilled I am for you that all your hard work and perseverance came together and you pulled off a stellar race beyond your wildest! Way to go my friend! Huge congrats to you! You are my hero! How exciting! 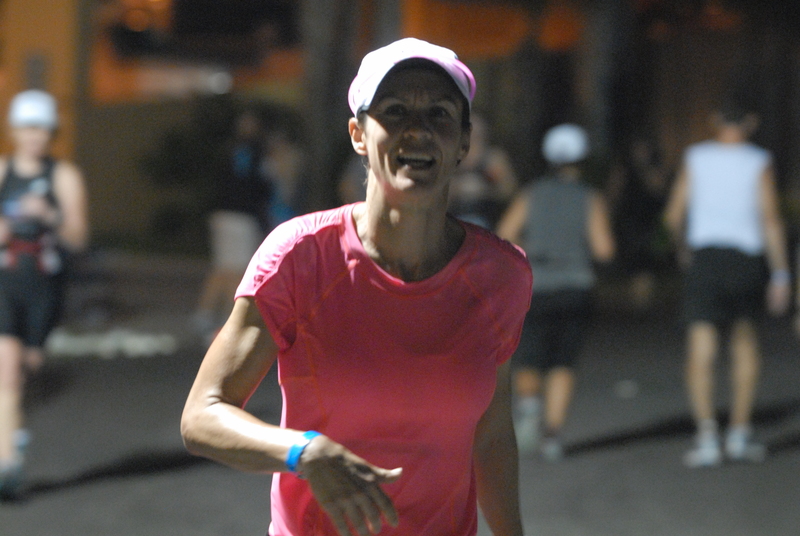 Your finishing picture shows just how happy you were to finish with that great time – look at your smile! Congrats! Next post: And Then What Happened?